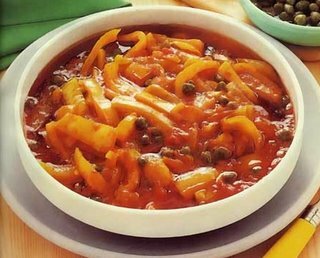 Caponata is famous vegetarian food in Italy. It’s easy for cooking and delicious. It has for sale in Italian restaurant. And then use in period Kin Jay festival. That is good idea for Vegan. Place onion and celery in a heavy casserole and gently cook in the olive oil till softened. Add aubergines, stirring till the aubergines are well coated. Place a lid on the casserole and gently cook the aubergines, turning them round from time to time until they are very soft. Add tomatoes, tomato paste, sugar, vinegar, sultanas, capers, green olives, and pine kernels. Season with plenty of pepper and simmer for 15 minutes, stirring frequently. Transfer to a serving dish, garnish with parsley and lemon wedges. This makes a substantial starter and is best served at room temperature with plenty of good French bread.